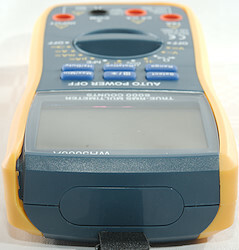 This meter do not have a brand, but has lot of ranges and functions. 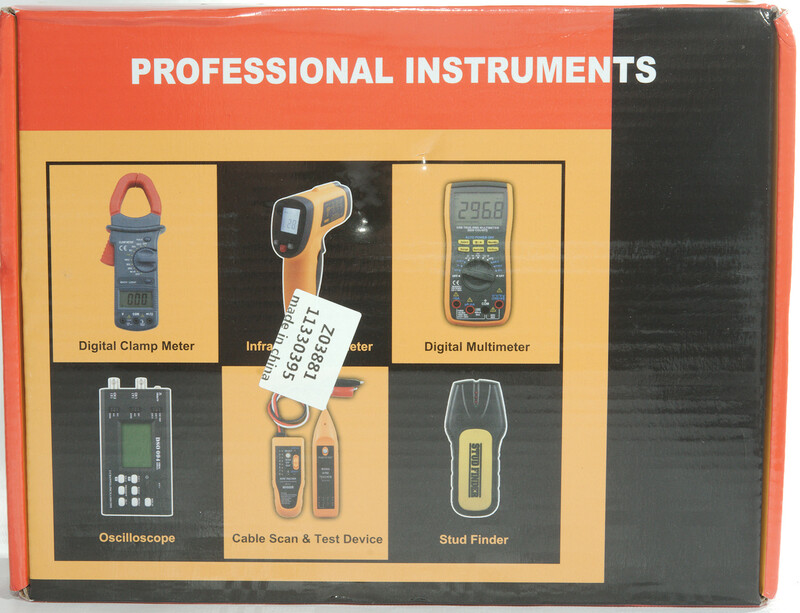 The meter arrived in a cardboard box without any information on. The box contained the meter, probes, thermocoupler, magnet, strap, transistor tester adapter and a manual. Probes are not branded and are specified for CAT III and CAT IV, this cannot be true with that much tip exposed. The plug is fully shrouded but a bit short. 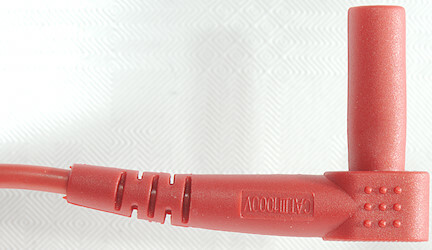 A standard cheap thermocoupler with a two banana plugs. The transistor tester, thermocoupler, capacitance tester socket. 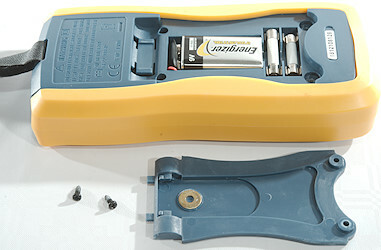 The meter includes a strap with a magnet. 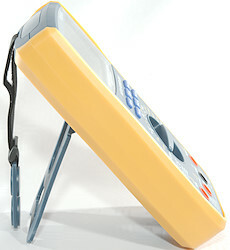 The rotary switch and button can be used single handed when using the tilting bale. The above picture shows all the segments on the display, a few of them are not used. 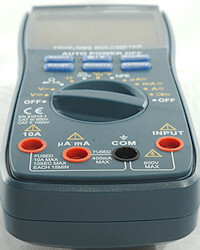 Usually the meter shows the selected range and the value. H: Freeze the display, press again to release. Hold down to turn backlight on. Max/min: Capture maximum and minimum values, the sequence is max/min/normal, during normal max/min is cleared. Range: Switch to manual range and select range, hold down to activate automatic ranging again. Relative: Remember current value and show further values relative to this, press again to disable. 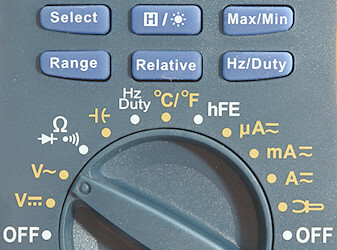 Hz/Duty: Select frequency in AAC modes, will also change between frequency and duty cycle in Hz mode. REL and max/min will disable auto ranging. Off: Meter is turned off. Hz Duty: Frequency and duty cycle. 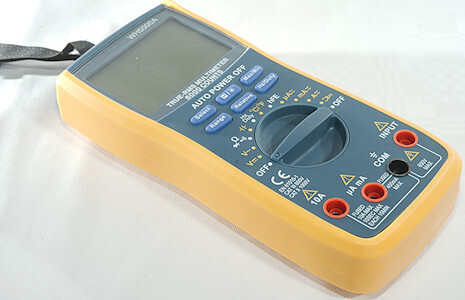 °C/°F: Measure temperature with a thermocoupler, will display meter temperature when no thermocoupler is connected. 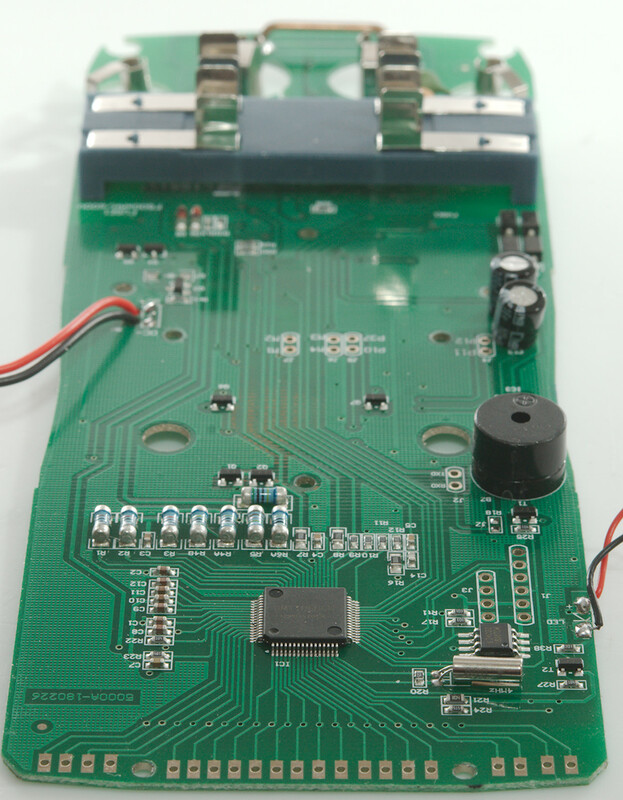 hFE: Transistor tested, requires supplied adapter. CON: The common terminal for all ranges. Logical frequency input (Hz) requires a zero crossing. 1 VAC is 5% down at 2.0kHz (RMS will not work at the frequency). 10uF takes about 4.5 seconds to measure. 11000uF takes about 9 seconds to measure. 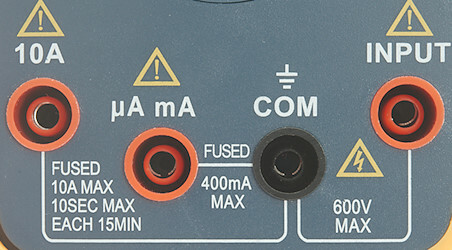 No rated overload on capacity ranges, but a reference to the uAmA fuse as protection. 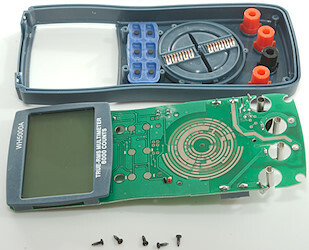 Meter works down to 2.2V, where it turns off, battery symbol show at 6.7V. 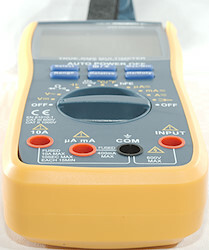 The meter reading is stable until the meter turns off. 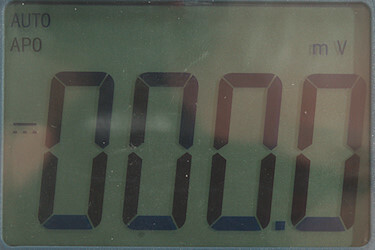 The meter may need a few display updates before it shows the correct value. 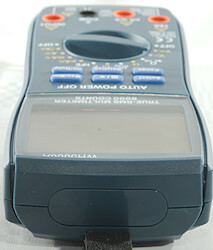 Backlight is blue and will turn automatic off after 15 seconds. Standard probes cannot be pushed fully down. 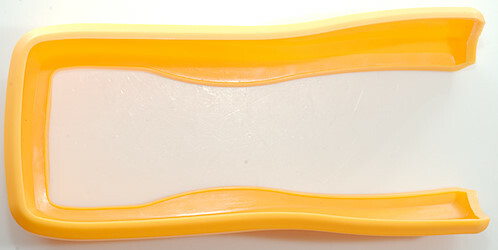 Size is 190 x 86 x 46mm, thickness includes magnetic hanger. 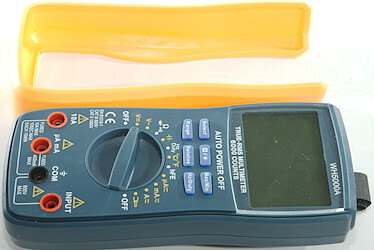 Probe resistance about 25mOhm for one. 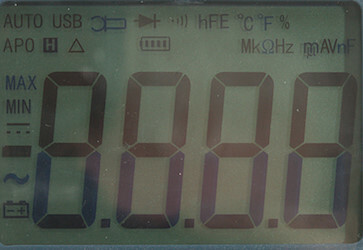 Large DC values may prevent the meter from showing AC values and may even reset it. I had to remove four screws and two fuses to open the meter. 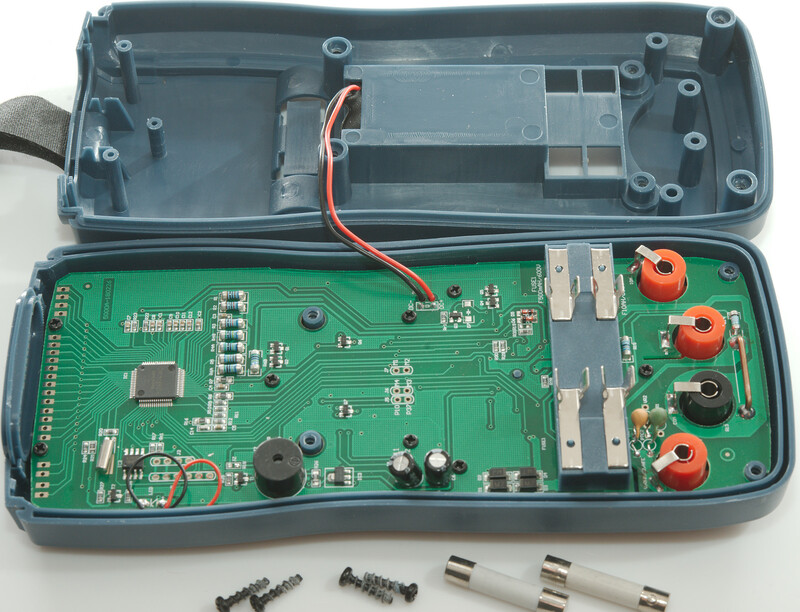 I do miss some external markings which fuse goes into which holder, it is marked on the circuit board. The fuses are mounted on a bridge across the circuit board, nice solution to make them external accessible. Five more screws and I could remove the circuit board. In fact I only needed to remove two screws! The range switch is mounted on the circuit board with 3 screws and it is not necessary to remove it. 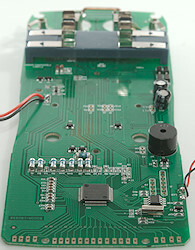 If only the correct two screws are removed, the circuit board looks this way when removed. 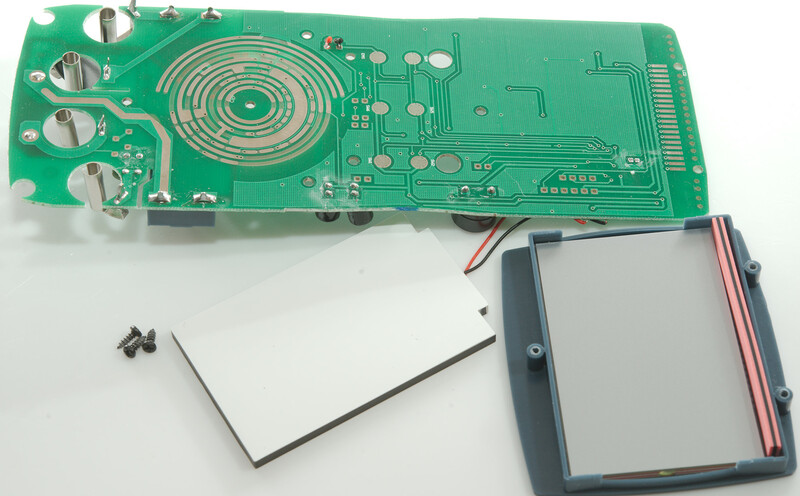 Display is also mounted on the circuit board. That was another 3 screws. The 10A shunt (R13) is moderate in size, next to is the mA shunt (R14: 0.99ohm) and near the fuses the uA shunt (R15: 99ohm). 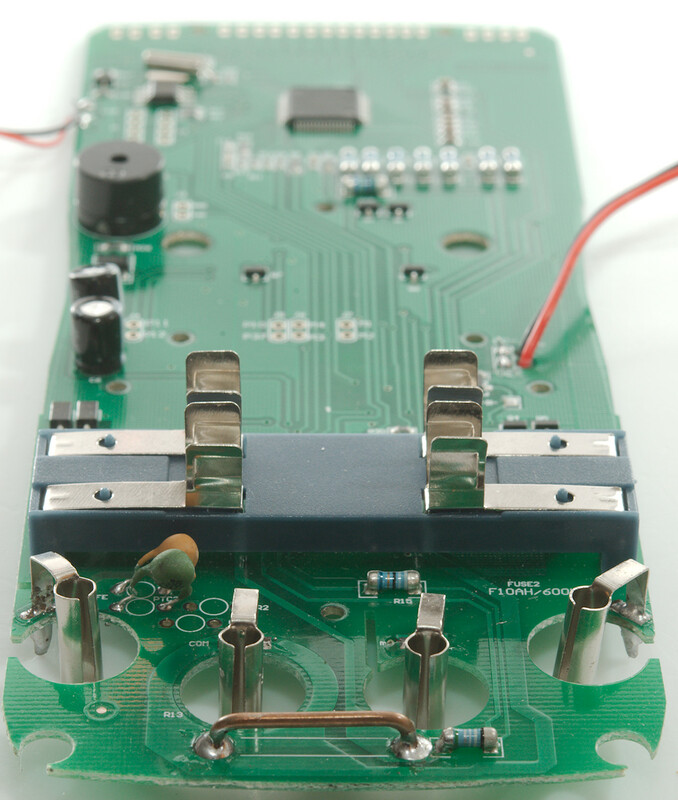 The uAmA ranges are protected by a fuse and four diodes (D1..D4). 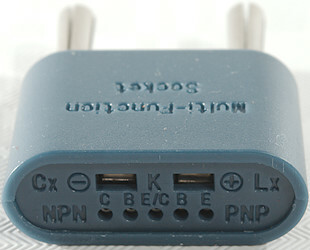 Voltage input uses a PTC (PTC1) and two resistors (R6A & R6B: 2x5Mohm). Ohm and capacitance uses a PTC (PTC2) and a resistor (R8: 900kOhm) for sense input and another PTC (PTC1), a transistor pair (Q1 & Q2) and a series resistor (R7: 100ohm) from the chip for current output. 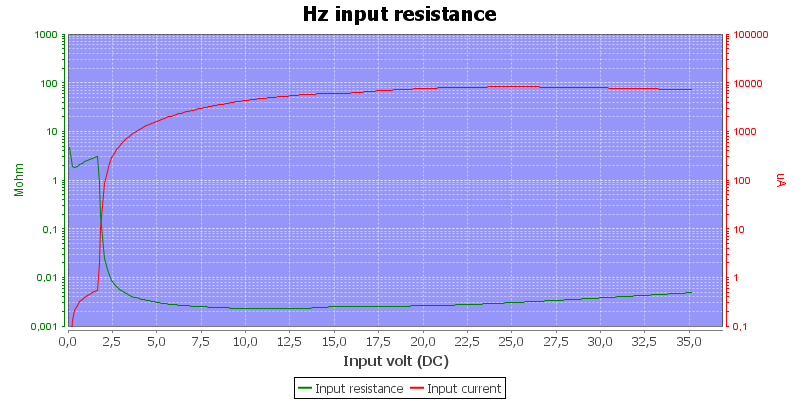 For Hz, temperature and clamp input the same path is used (PTC1, Q1 &Q2, R7). 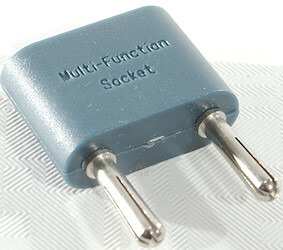 For HFE it is again a PTC (PTC2), but another transistor pair (Q4 & Q5). The multimeter is, as usual, based around a single chip (IC1: DM1106BEN) and a EEPROM (IC2: 24C02) and uses a 3 volt regulator (IC3: 7330-A) for supply. Near the PTC's are space for two MOV's in series connected to PTC1 and common. I doubt they would have much effect, MOV's are often needed on both input and some longer distances are required. 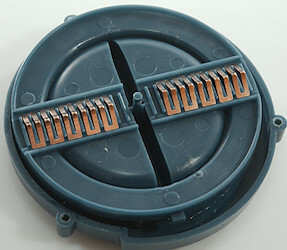 This meter had a few issues putting together again, first the small steel balls inside the range switch and then getting the fuse holder to fit the cutouts in the enclosure, when that succeeded all the screws had disappeared (They where found on the magnetic hanger). 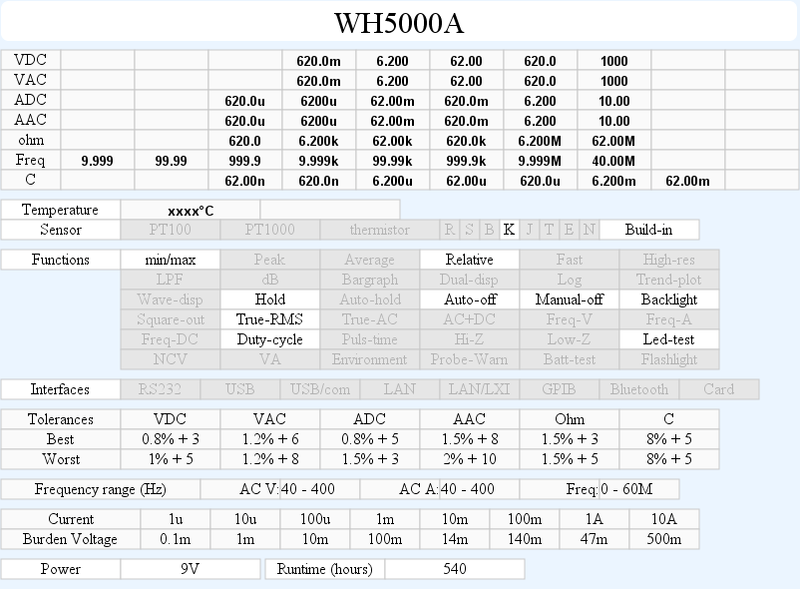 The CAT rating is not correct, 600V fuses are not enough for 1000V, input protection is better than some cheap meters, but that do not make it good. The actual input rating is also very confusing. 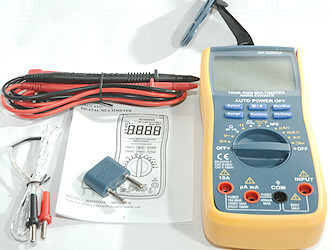 For hobby use it is fine and can be used on mains voltage from normal mains outlets, it has many ranges and also min/max, but I am missing frequency in voltage and current modes.